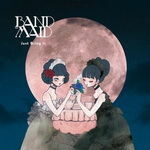 This is the first full-length album of BAND-MAID. Limited edition of the CD comes with a booklet comprising the shots of the maids on stage! Taking a look at the photos reminds me of their live performance that I first experienced December 2016. Seeing them playing live on stage in front of my very eyes, singing along with the songs, it was nothing but fun. 13 songs on this album are cool, however, I'm pretty confident that seeing them at their live would be much cooler than just listening to the CD.